David Gauntlett | Media Studies 2.0: a whole new book! Some people have emailed me to say, basically, ‘Eee, look, some bloke has nicked your Media Studies 2.0 thing!’. Or, in slightly more words, ‘Didn’t you do an article and then a book called Media Studies 2.0? Because now someone called William Merrin has also done a book called Media Studies 2.0. What’s going on?’. So, this blog post explains what’s going on, and draws your attention to William Merrin’s book, which is a very good book. Back in February 2007, I wrote a short provocative kind of piece called ‘Media Studies 2.0‘. It argued that the old model of media studies, built around a distinction between producers on one side, and audiences on the other, with publishing and broadcasting institutions in between, was rapidly collapsing. And that ‘media studies’ was doing very little about it. I mean, it was collapsing because users of media in 2007 were able to create and widely distribute material themselves – this was no longer the preserve of an elite – breaking down the polarisation of ‘producer’ vs ‘audience’, and also that the significant institutions were no longer just publishing and broadcasting ones, but also those involved in various kinds of online exchange. Keen observers of the calendar will note that February 2007 is more than seven years ago now. And the point remains, I think, very true – both about the collapse of the old model, and about practitioners and teachers of ‘media studies’ mostly still trying to ignore it. Of course, quite a few of them have started to catch on by now, sometimes really properly, and sometimes in enclosed ways – acknowledging it in order to wish it away. Anyway. Part of the background is that when I wrote that ‘Media Studies 2.0’ piece in 2007, which I just bashed out like a blog post, I then thought, ooh, I wonder if anyone else has used the phrase ‘Media Studies 2.0’ before? And it turned out that they had – William Merrin, a lecturer at Swansea University, had started a blog a few months earlier called ‘Media Studies 2.0’. I acknowledged it and included a link to it at the end of my piece. Since that time, to be honest, I think William Merrin probably always thought that I’d nicked his phrase, which I hadn’t, but you could see why he might think that. I asked him about it when we spoke recently, and he told me that he had never harboured such a thought, but you might expect that he did, and you wouldn’t blame him. Thank goodness, then, for William Merrin, who has set out the arguments in a sober and elegant manner, and anticipated many of the criticisms that opponents might have hoped to chuck in his path. He makes it clear that Media Studies 2.0 is not a rejection of traditional forms of media, but is interested in the ways in which they are changing; is interested in new media, but is not a celebration of it; and is interested in all forms of media, including non-broadcast and pre-broadcast media. (He even cunningly accuses ‘Media Studies 1.0’ of being ahistorical, since it is only concerned with the twentieth-century broadcast forms). Readers of Merrin’s argument will hopefully be persuaded, too, that ‘Media Studies 2.0’ does not ignore inequalities of access to media and telecommunications – rather, it makes these more visible, by looking at the full range of media possibilities. It is only when we consider, for example, the role of access to online political social networks versus a diet of satellite-TV soaps and gameshows, that we can begin to evaluate which populations are ‘media rich’ and which are ‘media poor’. (I am not saying that access to online political social networks can change people’s lives; I am saying it is a worthwhile dimension of a research project). Discussions of new media always seem to bring up the issue of access, and this is a welcome change from the ‘1.0’ status quo, which for some reason never really seemed troubled by the question of whether people could afford to, say, go to the cinema or buy a daily newspaper, both of which are luxuries which cannot regularly be enjoyed by many millions. Importantly, Merrin notes that critics may attempt to dismiss Media Studies 2.0 with cries of ‘technological determinism’ (correctly predicting Andrejevic and Brabazon, who attempt to sound that note in this issue). He rightly highlights how inappropriate this response is: to notice the arrival of new technologies, and to be curious about how they are being used by individuals, governments, businesses and other organisations, has nothing to do with assuming that it has any particular kind of inevitable implications or impact. So that was all good. 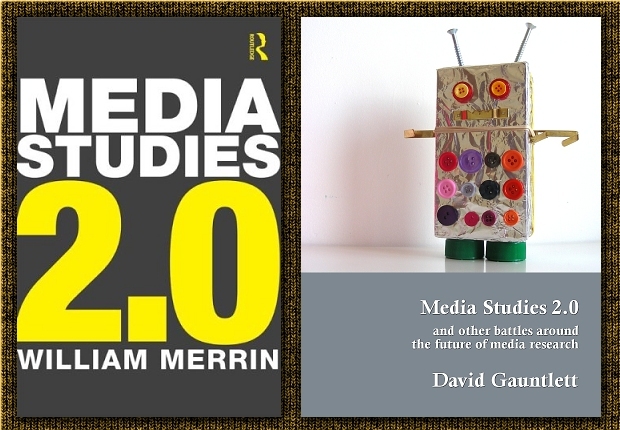 A couple of years later, in 2011, I published a Kindle book called Media Studies 2.0, and Other Battles around the Future of Media Research, which included the original piece and expanded on those themes with various other chapters. (You can read the page on this site about that book, here, and read a blog post about it as a form of DIY book publication here). And now, another three years later, William Merrin has brought out a book called Media Studies 2.0 as well. His argument is similar to mine in general terms, but very different in the detail, primarily because he’s developed a whole argument based on a rich understanding of history and previous theories about media, including an excellent revival of Marshall McLuhan. Media studies isn’t helping itself here. The discussion of digital media is happening everywhere today – among the public, commentators, the media, the government and within nearly every other academic discipline. Everywhere, that is, except in media studies where it remains an optional interest and where the broadcast mindset and conceptual categories prevail. But the broadcast model and its audiences are the past of the discipline and so too are many of its major approaches. US-style empirical communications research is too specialised, is dull, is unable to follow the ecological complexity and speed of digital transformations and remains uncritical and administrative in orientation. The UK Culturalist tradition that, as James Curran observes, became globally famous has become obsolete. Reduced to a caricature of its once-political self, committed to the performance of its own privileged methodologies and viewing reception through the anachronistic prism of the ‘audience’, its simplistic humanism uncritically valorises all individual behaviour, refusing to think of the user in any more complex way. And meanwhile television and film studies continue apace, with the continual discovery and discussion of new programmes, films, directors, genres and national cinemas, like an academic perpetual motion machine, with no necessary reference to the changing media realities outside.